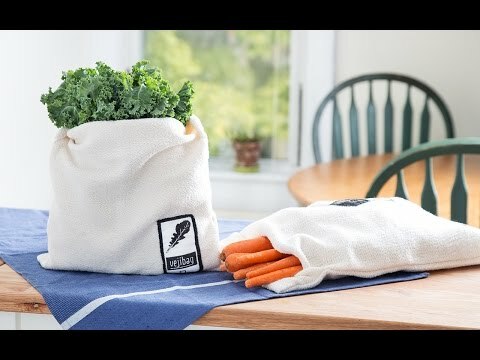 Plastic bags are no match for the Vejibag, an ingenious produce keeper that’s made of American-grown organic cotton. This sustainable vegetable bag gives produce the humidity it needs, keeping it fresh and crisp far longer than plastic. A beautiful, natural product for better eating. Standard: Dimensions: 11" x 0.31" x 13"; Weight: 0.2 lb. Long: Dimensions: 11" x 0.31" x 17.5"; Weight: 0.28 lb. Extra Large: Dimensions: 14" x 0.31" x 17"; Weight: 0.37 lb. but I am not organized enough to use it regularly. I buy large bags of vegetables at Costco and using these bags I never throw any away. I tried some other types and they do not work. I bought 2 of both sizes. I wish I bought more. It saves money. No throwing half of my produce out. I tried other products and returned them. I was extremely skeptical about the claims this product was making. But I read the great reviews and decided to try it when it went on sale. I wish I had bought more. I have tried most of the products that claim to keep your produce fresh. I've returned them all. I even tried putting paper towels in layers in my bags of spring mix. It doesn't work. So the idea of keeping my salad in a wet bag sounded absurd. Works great for lettuce. Not so much for cut up veggies like carrots or celery. Or maybe I'm not doing it right for them. Any suggestions? Organic gardener Sally Erickson couldn’t bear the thought of selling her homegrown greens in plastic bags. She knew that fresh produce needs humidity, so Sally created the Vejibag. This ingenious vegetable bag keeps produce crisp and fresh longer. The Vejibag is made of 100% organic American materials. The cotton is grown in the southern U.S. and sewn by hand in North Carolina. The resulting fabric is beautiful, breathable, and easy to clean. Add just a bit of moisture to the bag every few days and watch your veggies thrive. Carrots stay crunchy, kale stays crisp, more plastic stays out of our landfills, and more U.S. workers find pride in contributing to a healthier planet. There really is much more in this vegetable bag than just produce.